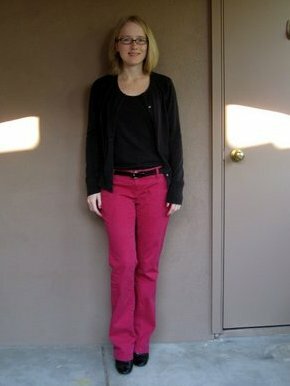 I had a pair of red pants from Old Navy that I loved from, oh, 2004-2008. Eventually I let them go because they had faded. Also, they weren’t really the right size anymore when I slimmed down by about 10 pounds, which is enough to make a difference on my 5’2″ frame. I’ve been chasing after those red pants ever since. These are more fuchsia than red, from Target clearance a few years ago. Next up: fancier professional crisp red pants that are a different material than fading cotton chinos. Big dreams. January 30, 2015. Tags: clothes, Target, What I Wore to Work Today. 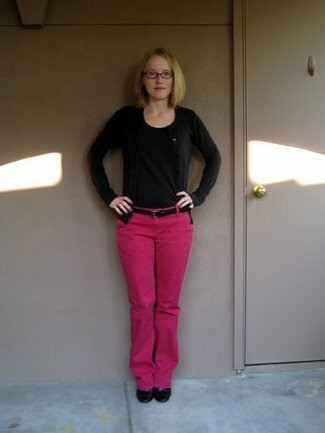 Pictures, What I Wore to Work Today, Words.